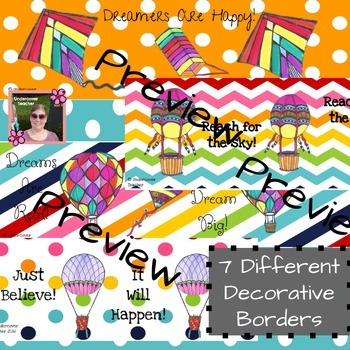 *7 different borders with a variety of colors and hot air balloons! *Just print, laminate (if desired), and decorate! *Uplifting sayings on each border! *Great for classroom and hallway display! *Makes a cute bulletin board! *Two sections of border per page! 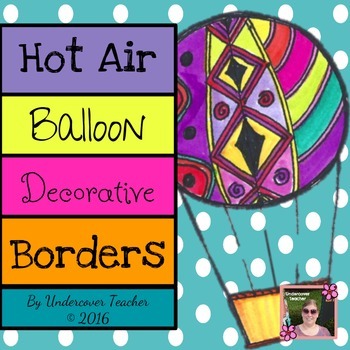 I'll be making a classroom decoration set like this, so be sure to check my store for matching Inspirational Hot Air Balloon decorations! Does not contain removable clip art! Clip art cannot be copy/pasted and used in other items. Thanks! -Follow me, be the first to know about new resources and sales! Check out my other fun teaching resources! This product is meant for the buying teacher's classroom only! If your teacher friends like my decorative borders, send them back to my store for their own copy! Have an awesome school year!